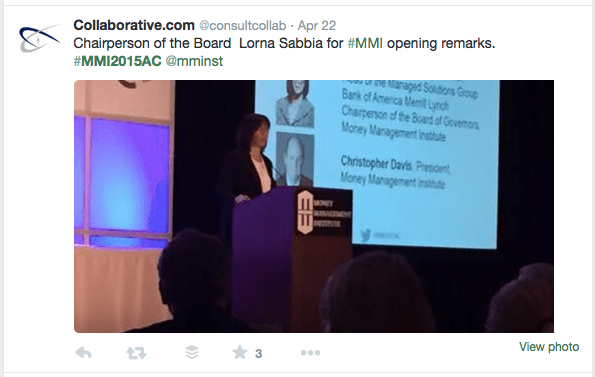 The theme for the Money Management Institute’s 2015 Annual Convention in Charlotte, NC was “Leadership Challenges in a Period of Fast-Paced Industry Transition”. This was well-timed considering the whirlwind of changes that have occurred over the past year. The attendees were a good mix of asset managers, sponsors and vendors that led to some lively discussions. For those of you who were unable to attend or for anyone who was there but was busy schmoozing and missed a session or two, here is a quick recap of the entire conference as it looked on Twitter. #MMI2015AC begins now w/ co-chairs @BlackRock’s Mike Lewers & @MetLife’s Jeff Wilk! Pick up your badge in the Grand Promenade on 2nd Floor. The conference got off to a roaring start with an inspirational keynote speech from Andy Sieg, Managing Director, Head of Global Wealth & Retirement Solutions at Merrill Lynch. Sieg came loaded with a barrel of tweetable quotes that made it a pleasure for anyone trying to summarize his presentation. “The US economy is a rock of stability when compared to the rest of the world,” was one of the first he shared. Sieg stated that the US has unprecedented growth possibilities. He listed four transformations that are changing our world and said “technology is a force multiplier”. Sieg reported on the success of their ML One platform that consolidated five formerly separate platforms. Jack Sharry and a panel of industry experts dived into Goals-Based Wealth Management (GBWM). What it means, which firms are adopting it and what direction the industry is going. Impact investing is the practice of investing with the goal of generating measurable social and environmental impact alongside appropriate financial returns. The MMI announced a new white paper examining how practitioners are integrating impact investing so that it becomes strategically material. It will present evidence that impact investing can improve how the financial services industry manages to the kinds of outcomes that clients seek and meet growing demand for socially acceptable investing. Burckart discussed the Rise of the Virtuous consumer. How firms like Patagonia and Whole Foods have built their brands around environmentally friendly business practices. He explained how the current consumption model could be flipped around so that growth is untethered from resource constraints. The world should be moving towards a ‘Circular Economy’ where nothing is wasted. Snider spoke about how social responsibility has gone from fringe idea pushed by noisy activists to mainstream concept that has been embraced by most of the largest companies in the country. The 2015 MMI Advisory Solutions Pioneer Award winner was Bill Crager, President of Envestnet. He was introduced by Jim Seuffert, former CEO of Pershing Managed Account Solutions and co-founder and former COO of the Lockwood Advisors. Seuffert is now Senior Partner at Wheelhouse Analytics. Day Two began with a riveting presentation by Kim Lear, Director of Content, BridgeWorks. Lear is an expert on demographic characteristics and behaviors for each generation. She had the somewhat hung-over MMI audience glued to their seats and wide awake as she explained the differences between each group. She also explained how advisors should tailor their message and communication style depending on the age of their prospect or client. By the time a Generation X’er is 20 years old, they will have watched 23,000 hours of television, Lear reported. This means they have seen a lot of advertising, so they are difficult to sell to. Boomers are in the middle of the transformation to retirement, but still have responsibilities with work and family, Lear noted. Some Boomers spend up to 21 hours per week caring for aging parent (MIT & Gallup). All this stress can lead to emotional exhaustion, which advisors would be wise to help mitigate in their communications, she stressed. This was the UMA/UMH panel that is requisite for every MMI conference in order to cover the latest news, emerging trends and prognosticate about the future of technology, design and client experience. 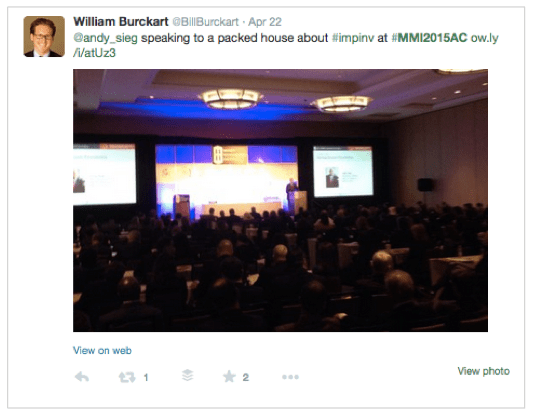 I hope you enjoyed this Twitter recap of the MMI 2015 Annual Convention. Check out some of the related content below. Also, follow us on Twitter to get the latest information related to wealth management. Conference Summaries	What’s New in Portfolio Rebalancing Tools?